As a huge Disney fan, I am excited to share with you some Disney magic. 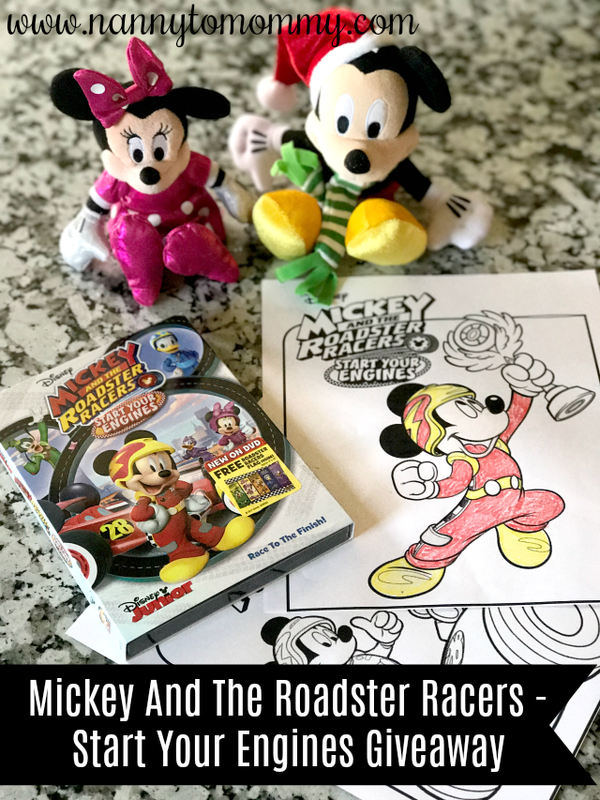 We received a copy of "Mickey & the Roadster Racers: Start Your Engines" back in August when it first became available on DVD and to help promote that not only can you find some awesome coloring sheets and other activities available to print, but a $25 Disney Gift Card Giveaway too! Mickey and the Roadster Racers are back and cruising full speed towards fun adventures around the globe! MICKEY AND THE ROADSTER RACERS: START YOUR ENGINES will be zoomed towards Disney DVD, and you will want to keep up with Mickey, Minnie, Donald, Daisy, and Goofy! Join Mickey and the Roadster Racers for the ride as they encounter the world’s best spy, compete in a hot-air balloon race, and even help the Queen with her stolen Royal Ruby! At the heart of MICKEY AND THE ROADSTER RACERS: START YOUR ENGINES is friendship, teamwork, and exciting adventures that will make you want to be a part of the gang! Welcome to the Pumpkin Patches & Wins Giveaway Hop brought to you by The Hopping Bloggers! Hosted By: Mama's Geeky & Women and Their Pretties Co-Hosted By: Crazy Busy Family Life & Sunshine and RollerCoasters Each giveaway has a value of a minimum of $15, however some are worth much more. Be sure to enter to win all of them because there is no limit to how many you can win. GOOD LUCK! If you're a blogger looking to connect with brands: Join The Hopping Bloggers database and get started today!If you're a brand looking to work with a network of professional bloggers: Check out the creative campaigns The Hopping Bloggers has to offer! If you would like to see your product featured in our upcoming Holiday Gift Guide or another - feel free to contact us. This giveaway is sponsored by Nanny to Mommy. Participating blogs are not held responsible for sponsors who fail to fulfill their prize obligations. This contest will run through October 6, 2017 at 11:59 EST. No purchase necessary. US entries only. Must be 18 years or older to win. This promotion is in no way sponsored, endorsed, or administered by or associated with, Facebook. You understand that you are providing your information to Nanny to Mommy and not to Facebook. We have represented each sponsor with the expectation they will fulfill their prize in a timely manner. We will contact the sponsor regarding your prize(s). The sponsors, in most cases, are shipping their items to you directly. I will make every effort to assist you obtaining your prize. If there is an issue with a sponsor, please notify the blog you won a prize from within 4-6 weeks for assistance, after that we may be unable to assist you.